Greetings from the Southern Maine Coast, as I contemplate my personal and family history in a be-here-now moment. My parents, married in 1951, have lived in the same house since. They are both in their mid-80s and mentally-sharp. “Going home” is going home, to the house in which I was raised. I turn to memories of vegetation as is my obsession. 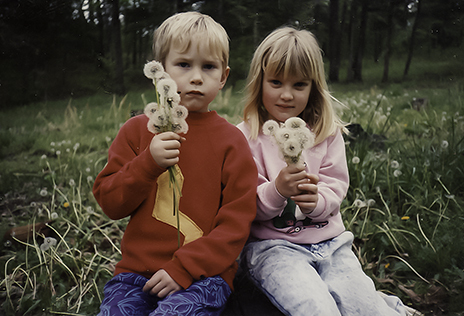 In the past week I’ve been scanning old family photos. Amongst the files was a long-forgotten newspaper interview with me from the Portland Press Herald published in 1990. The accompanying photo has me ankle-deep in dandelion blossoms on what we called the side lawn at my parent’s home. My dad, Herb, reminded me that my grandmother, Lena Foster, went out every spring and harvested dozens of dandelion crowns—the rosettes of leaves obvious before dandelion flowers. 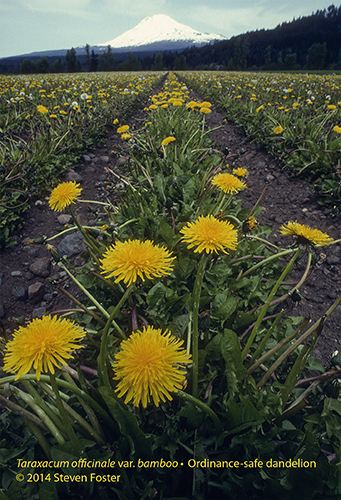 I fondly remember eating my grandmother’s boiled dandelion greens with a dash of vinegar. In his 65-years of maintaining, mowing and improving the side lawn, my dad has proudly managed to turn the entire lawn into a monoculture of neatly mowed grass. “All of the dandelions are gone!” I exclaimed. “Good,” my dad, Herb replied. My childhood memory banks flash back to scenes of crouching amidst the un-mowed thicket of common milkweed, aflutter with monarch butterflies. The colors and movement were punctuated by the random symphony of polyrythmic insect buzzes, hums, and chirps. My son and his cousin. Now both in their late 20s. When I was born in 1957, mowing was done with non-motorized push mowers. The cut was rough, but only a small area was mowed. Tractor-mounted mowers were used only to harvest hay. Now Americans are obsessed with every manner of hand-held, self-propelled, riding, and undoubtedly soon, robotic mowing machines. A Professor at the University of Massachusetts Plant Sciences Department, Lyle E. Craker, reminds me that the best high-paying jobs available for graduates in plant sciences is in the field of “turf management.” I haven’t mowed my yard this year. Interesting mix of grass species going to seed. I’m not a weed! See, I’m cultivated!